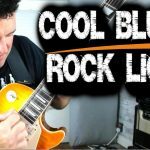 This powerful lick is typical of the Gary Moore guitar style. The lick shows Gary using the sliding C# minor pentatonic scale at the 9th fret. Like many Gary’s licks, this one is basically a blues lick. It’s similar to the kind of thing Albert King might have played. No surprise really…Albert was a big influence on Gary Moore. 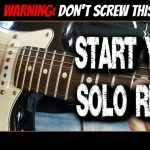 Once you can play this lick borrow the bits that make it up and see how you can recycle them to get some Gary Moore style licks of your own.